With 20’ high ceilings and expansive windows, this mountain home was built to capture the amazing views of Bear Mountain and the valley beyond. The renovation to this fairly new build was focused around elevating materials from standard builder finishes to reflect the owners’ own sense of style. The enclosed walk-in shower felt dark and cave like and was opened up to rest of the space with a large glass panel in place of the wall. The shower surround and floor pan were refinished with smooth stone mosaics in warm white and grey tones, reflecting the West Coast feel of the home. 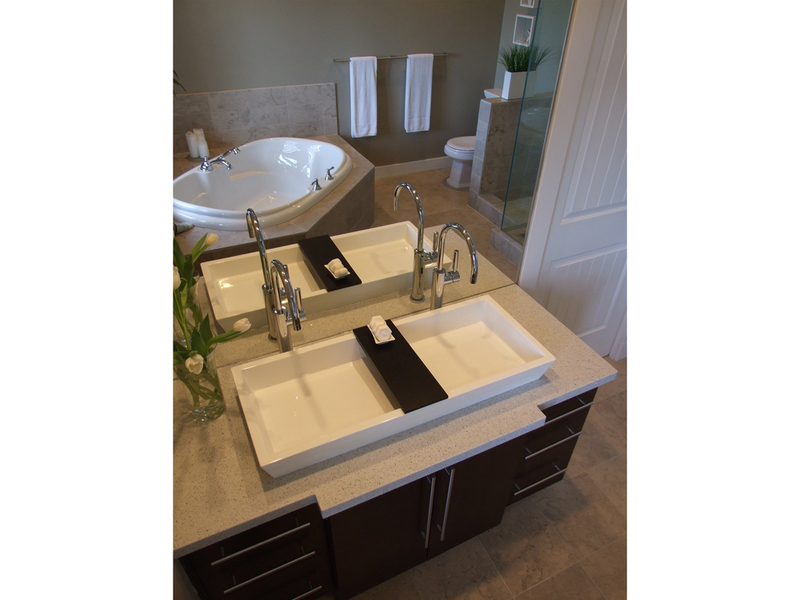 A new quartz vanity with double wide surface mount sink and single-lever tower faucets provide the function of a double sink with a more contemporary appeal. New modern light fixtures, mixed marble mosaic backsplash tile and furniture transformed the open concept kitchen and dining spaces into a feature at the hub of the home.